My first full day here at Soapstone was wonderful! I got a great night's sleep -- rain pattering on the roof, river rushing by down below, wind whispering through the trees. 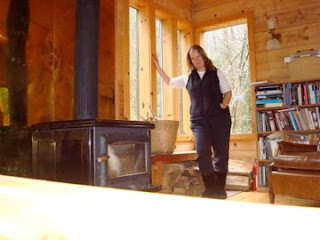 This morning, I woke up and watched the river for a while, then started a fire in the little stove (the Queen!). I've been feeding it off and on through the day, and it's nice and cozy now, on every floor. A., the poet/potter who I'm sharing Soapstone with, has her own little separate studio called "Water." It's lovely and cozy -- she has both desk and bed there, and the little stove to keep her warm. A hallway connects her studio with the main part of the cabin, and it holds the refrigerator, the washer and dryer and the bathroom -- this is joint territory, always. The hallway opens into the kitchen and the discussion area (where the big stove is) -- these spaces are jointly inhabited at certain times of the day -- mid-day, for lunch-making, and the evening for dinner-making and sitting by the fire, should we decide we'd like to. The rest of the time, that space is mine to use. Going up a ladder takes me up into my little loft, where I have a full-size futon on a platform, overlooking the river. There are windows everywhere! When the clouds moved last night, I could see the full moon rising. Another ladder takes me to a platform above my bed (for sitting or storage), and then *another* ladder takes me up to where I am now, the Cube! This is my writing space. It's forty feet up from the main floor, and has big round windows on every side. It overlooks the river, as every room in the house does. This space is called "Wind" for good reason -- I'm up amongst the treetops, just like when I climbed the walnut trees at home growing up, but with a lovely little desk to write on, and cozy walls all around. This afternoon, I arranged my things -- my sleeping area, my clothes, and my writing area. All this going up and down the ladders and stairs is good for me! I took a walk around the Soapstone property before it got dark, to see the river up close and get the lay of the land. The river is swollen and moving fast from all the rain, which continues today with only brief pauses. The trees are a mixture of evergreen and deciduous, and surrounded by ferns. It's five o'clock now. In a bit, I'll go downstairs and make myself some dinner and another cup of tea. Then I'm looking forward to writing through the evening. What a great gift this time is, to be in the woods and write! wow! it looks and sounds amazing! It's really lovely, Peter! I'm enjoying it immensely. Hopefully I'll come out of the woods with some good words scribbled down!